Mother’s Day is just a few days away and it is reasonable to assume that a fair number of people have not yet gotten around to figuring out the perfect gift. Instead of running to stores or getting a last minute something that she might not need, check out these “tea of the month” clubs and tea subscription programs that might offer a special gift that she will enjoy long after Sunday. Join for the 6 month or 12 month option. Select your favorite tea type: flavored, decaf, herbal, black or green/oolong. Adagio will send two teas every other month. You can see the list of teas in the lineup here. The 6 month club costs $39-49. The 12 month club is $74-$94. Subscribers can choose a monthly option of $18/month, a 6 month subscription of $16.20/month, or a 12 month subscription of $12/month. Choices include caffeine-free, iced tea, premium single origin, pyramid teabags, signature tea and wellness tea. The Four Season Club offers a tea selection every three months ($121). There is also a 6 month membership (3 shipments over the 6 month period for $176) and a 12 month (monthly delivery for $291). The tea types included are outlined on their page. Each month subscribers receive a packaged assortment of four teas: The Devotea blends, single estate teas and some “club only” offerings. The club is a 12 month club with three different tiers available. “Taster’s Delight” provides an assortment of four teas that equal approximately 30 cups for $13.99/month. “Drinker’s Essentials” yields 100 cups for $27.99/month. 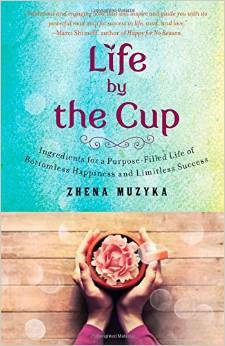 “Addict’s Nirvana,” $40.99/month, yields 200 cups. Three-month gift subscriptions are available for $48. The May assortment included Champagne & Berries (a green tea blend from Teas Etc. ), Mokabari East Assam (Lochan Teas), White Teas Concoction Liquorice (Devotea blend), and Spearmint Tisane (Devotea USA). Click here to see the March and April offerings. 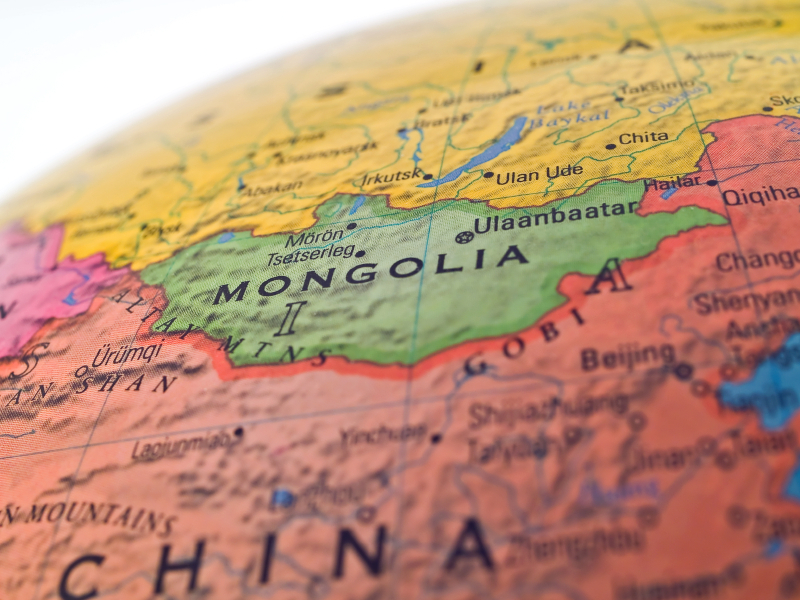 Each month you receive a shipment of two 50gram bags of tea. You can choose three month (£75 for U.S.), 6 month (£135) and 12 month (£260). May was a very jasmine month with jasmine pearls and jasmine silver needle. June will bring Iron Buddha and Yellow Gold. The program offers four different monthly options ($90-$99 for 6 months) focused on their teabag selections: Citizens’ Favorites, green, caffeine-free/decaf, and wellness. There is also a loose tea option ($120 for 6 months). Six and twelve month options are available. Tealet is a company focused on linking customers directly to farmers. In this program you’ll receive four teas every two months (60 grams each shipment). An annual subscription of six shipments is $215.70. A six month subscription is $128.85 for 3 shipments. Along with the tea will come information about the growers as well as information to help you better understand tea. 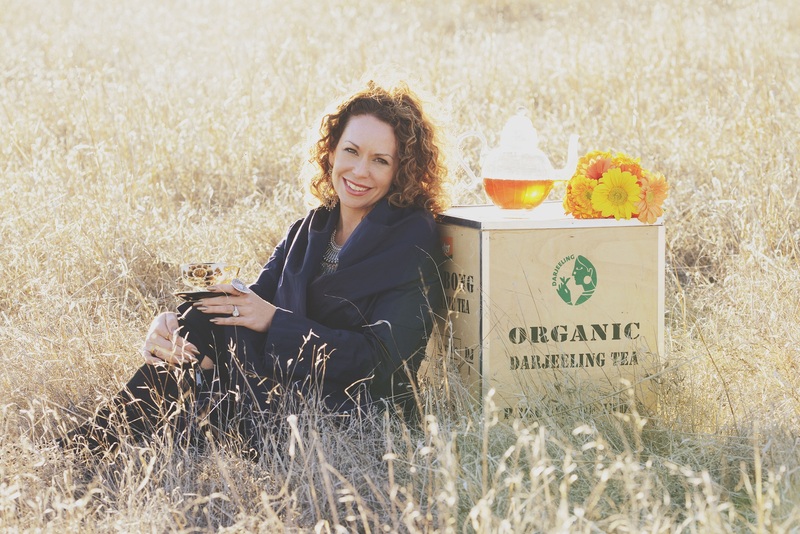 Teance has two different tea subscription programs available. The 3 month or 6 month Tea Subscription ($73.95/$144) and the 3 month or 6 month Connoisseur Subscription ($145/$260). The Connoisseur Subscription offers teas they do not usually sell online. Teavana offers a 12 month subscription program for $250. Recipients receive two 2-oz. tins of tea each month. The idea is that the teas can be consumed individually or blended together for a unique taste. The 6 month club is $130. The May offerings were a Monkey Picked Oolong and a Citrus Lavender Sage. The tea list can be found by clicking the link in the Description section of the 12 month program. 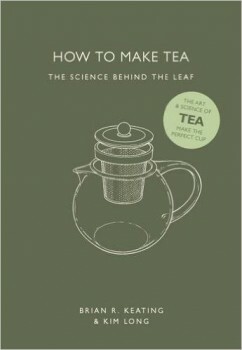 Over the past ten years some new and groundbreaking tea books have hit the market and become instant industry classics. “The Story of Tea: A Cultural History and Drinking Guide” by Mary Lou Heiss and Robert Heiss was released and took its place as a veritable textbook for tea enthusiasts. It was nominated for a James Beard Book Award and an IACP Cookbook Award and also won Best Tea Book in the USA from Gourmand Awards and a bronze for Best Tea Book in the World in 2008. The expanded version of “A Social History of Tea” by Jane Pettigrew and Bruce Richardson was considered a must-have before it even hit the shelves. Cynthia Gold’s “Culinary Tea” pushed other books aside on cookbook stands. The heavily researched “Tea: History, Terroirs, Varietals” by Kevin Gascoyne presented the science that many students of tea have longed for. 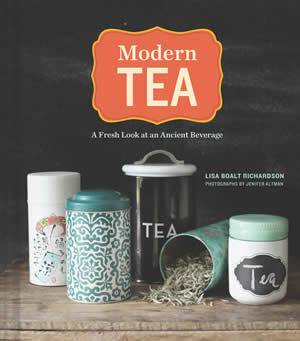 I do not hesitate to say that Lisa Boalt Richardson’s newest book, “Modern Tea,” belongs in this impressive grouping. “Modern Tea” is not a particularly lengthy book, at 164 pages, but it is packed with engaging stories, beautiful images and valuable information. “Tea is a beverage,” it begins, “…a commodity, a ceremony, an afternoon tradition, a drink of peace, a pick-me-up, a path to meditation, and much more.” As I read through the text it occurred to me that it is the perfect book both for those who are already tea enthusiasts, but also those who have newly discovered their passion and want a comprehensive primer for their explorations. Richardson offers a mix of well-researched history interspersed with personal stories that give warmth and color and make the world of tea feel close at hand. The tales will definitely inspire the armchair traveler in many readers. While the general topics covered in the book have been written about elsewhere, this book makes it seem brand new, with Richardson’s personality bursting off the page. The book begins with thorough explanations of the tea types but the author keeps it fresh and new with her own memories and lessons learned from visits to tea plantations and growing regions. There are detailed sections on buying and storing tea, along with both eastern and western steeping style descriptions. The step-by-step nature of these pages provide actionable items for readers and made me think again about some of my own practices. The lovely descriptions of various tea ceremonies including Chinese, Japanese, Taiwanese, English and Moroccan, not only bring us into those worlds, but also give us the knowledge we need to recreate versions of those ceremonies at home. Richardson never hesitates to delve into the science of tea, looking at olfactory experiences from this vantage point, along with data around antioxidants and caffeine. Staying close to her roots she also shares her thoughts on pairing tea with other foods, cooking with tea and tea cocktails, as well as ways to use tea in body care products. I do feel the need to disclose that through my years in the American tea world, Richardson has become a friend. But she has also been a valuable teacher as I pursued my Level 1 and 2 certifications with the Specialty Tea Institute. 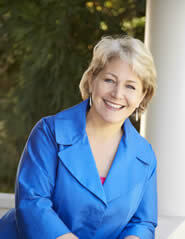 Her knowledge was thorough and she is an approachable and enthusiastic educator. I am delighted to say that these qualities come through clearly on the page. I strongly recommend that you give “Modern Tea” a read and that you share it with others who are beginning their journey in tea. In our house, my passion for tea may only be rivaled by my husband’s passion for soccer. It is unavoidable then that there would be a great deal of talk about the opening of this year’s World Cup. Brackets have been passed around the house and kids and adults alike are making their picks. It won’t take long snooping online to find many suggestions about how to make your game predictions. You can complete brackets based on population, favorite uniform colors, or careful analysis of team rosters. Maybe tea lovers need their own approach. 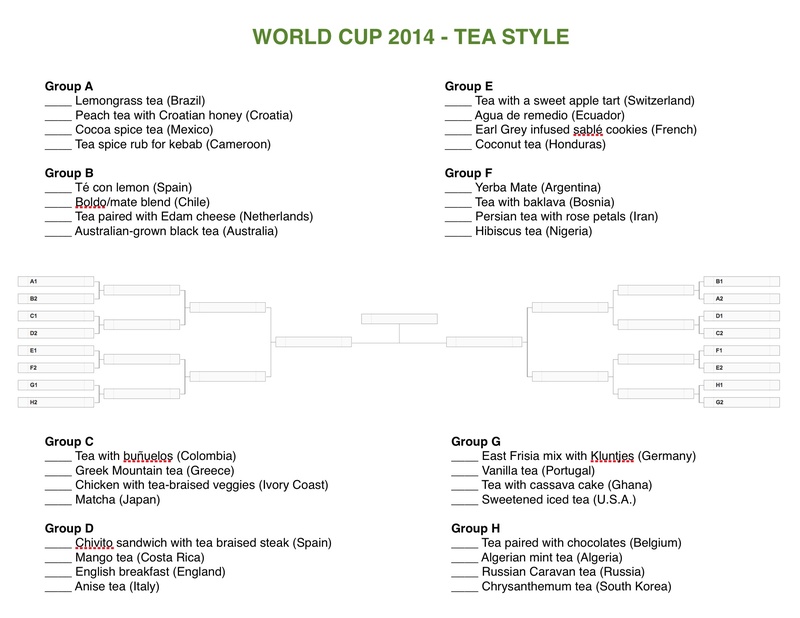 Tea Biz would like to present a 2014 World Cup bracket, completed tea style. For each country we’ve highlighted a type of tea or flavor profile or cuisine that is popular in each country. Argentina was a given with Yerba Mate as was a spicy chocolate profile for Mexico. In some cases we went with a traditional choice like Greek Mountain tea for Greece and matcha for Japan. For Cameroon and Spain we considered popular foods and added a tea spin. In Croatia we highlighted the beautiful flavors of the produce in local markets and in the Netherlands we paired tea with the incomparable Dutch cheeses. To play, in each group rank the countries 1-4 and then complete the rest of your brackets. Make your tea picks and let us know who you think the World Cup Champion will be. We’ll provide an update before the round of 16 and maybe add another tea twist.